For the 2011 film, see Breaking Up Is Hard to Do (film). For the jukebox musical, see Breaking Up Is Hard to Do (musical). 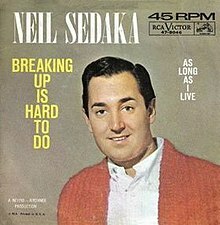 (1962) "Breaking Up Is Hard to Do"
(1962) "Next Door to an Angel"
"Breaking Up Is Hard to Do" is a song recorded by Neil Sedaka, and co-written by Sedaka and Howard Greenfield. Sedaka recorded this song twice, in 1962 and 1975, in two significantly different arrangements, and it is considered to be his signature song. Another song by the same name had previously been recorded by Jivin' Gene [Bourgeois] and The Jokers, in 1959. Neil Sedaka recorded both "Breaking Up Is Hard to Do" and its B-side, "As Long as I Live" in Italian as "Tu Non Lo Sai" and "Finche Vivro", respectively, further endearing him to his Italian fans. Described by AllMusic as "two minutes and sixteen seconds of pure pop magic," "Breaking Up Is Hard to Do" hit number one on the Billboard Hot 100 on August 11, 1962 and peaked at number twelve on the Hot R&B Sides chart. The single was a solid hit all over the world, reaching number 7 in the UK, sometimes with the text translated into foreign languages. For example, the Italian version was called "Tu non lo sai" ("You Don't Know") and was recorded by Sedaka himself. (1975) "Breaking Up Is Hard to Do"
(1975) "Love in the Shadows"
Though it was originally an uptempo song, Sedaka re-recorded it as a ballad in 1975. The slower arrangement was originally debuted by Lenny Welch; it peaked at #34 on the US Billboard charts in January 1970. Sedaka's slow version peaked at #8 in February 1976 and went to number one on the Easy Listening chart. It was only the second time that an artist made the Billboard Top Ten with two different versions of the same song. (1972) "Breaking Up Is Hard to Do"
(1972) "Looking Through the Eyes of Love"
Apart from Sedaka's own reworking of the song, by far the most successful cover of "Breaking Up Is Hard to Do" was done by the Partridge Family in 1972. While only a medium hit in North America, their version reached number 3 in both the UK and Australia. (1976) "Breaking Up Is Hard to Do"
Clay Aiken recorded the song as a bonus track for his 2010 album,Tried and True. sung and adapted by Claude François (co-author of "My Way") the title means "I'm still thinking of you". sung by La Onda Vaselina (1989). sung by Jitka Zelenková (1976). sung by Linda Finková & Pavel Noha (1986). sung by Iveta Bartošová (1996). ^ a b c "Australian Chart Book". Austchartbook.com.au. Archived from the original on 2016-03-05. Retrieved 2016-09-26. ^ "Image : RPM Weekly - Library and Archives Canada". Bac-lac.gc.ca. Retrieved 2016-09-26. ^ "Top Singles – Volume 26, No. 14 & 15, January 08 1977". RPM. Library and Archives Canada. Retrieved June 13, 2016. ^ "Top 100 Hits of 1976/Top 100 Songs of 1976". Musicoutfitters.com. Retrieved 2016-09-26. ^ "The Irish Charts – Search Results – Breaking Up Is Hard to Do". Irish Singles Chart. Retrieved July 2, 2017. ^ "flavour of new zealand - search listener". Flavourofnz.co.nz. Retrieved 2016-09-26. ^ Roberts, David (2006). British Hit Singles & Albums (19th ed.). London: Guinness World Records Limited. p. 419. ISBN 1-904994-10-5. ^ "Cash Box Top 100 8/26/72". Tropicalglen.com. 1972-08-26. Retrieved 2016-09-26. ^ Richie Unterberger. "The Marbles - The Marbles | Songs, Reviews, Credits". AllMusic. Retrieved 2016-09-26. "Eg veit i himmerik ei borg"
"Where the Lost Ones Go"